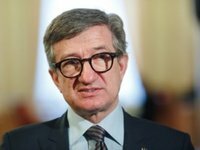 A People's Deputy of Ukraine (non-affiliated), former head of the Donetsk Regional State Administration, Serhiy Taruta, has announced about the creation of a new political party. According to him, today the society has a huge request for new faces - real statesmen, politicians who would think about the country, not about themselves. Because the current government, the current politicians have no trust among the population, because of the constant deception and populism, they cause only disappointment. "Ukraine needs a reboot of the whole system of power, and it can be done only through a new political movement, because the state's task is to help every person, and the state's policy must be built around the main value – a human being. Unfortunately, a person has never been this value in Ukraine," Taruta said on the air of the 112.Ukraine TV channel. "We have created a new political party. It will be built on the ideological principles of conservatism - this is a republican party with the main value - a human being," he said. According to the politician, this ideology is the most suitable for Ukraine, and is especially relevant in this period of time. "Republican ideology is based on increased defense capability, increases defense spending, and allows us to carry weapons, which is important now. But most importantly, it is established to develop the middle class of the population, he said. We will be able to raise the economy of Ukraine," Taruta said. Also, the parliamentarian noted that ineffective authority and corruption are even worse weapons than Russian tanks. Taruta believes that Ukraine's enemy is not only Russia, but also the Ukrainian government. According to him, the current system is established for corruption. "The high ranking officials strive for the power for their own enrichment, and they have all the possibilities at their disposal - from managing resources to appointments, he explained. An official must perform the service function and this will be displayed in our program," the politician said.